‘Loveheart’ cloud forms around the Moon, with Mars to the right, and the ship Meri’Ashar pulsing light above/between Moon & Mars, October 17th 2018. Flowing with the heightened assistance of Aquatic Star Family groups of the ‘watery’ constellations detailed in the previous post, we’d like to share a sequence of photos of the last two weeks that connect this higher dimensional Aquatic presence with dissolving aspects of the ‘lower Mars matrix’ and its inhibiting influence on the Earth’s vibrational shift, as part of a mission implemented during the last two months focused upon transforming Mars…and continuing on strong. Many aligned star family missions are running concurrently, interwoven in their assistance in, on and around the Earth and Solar System, and while not many details can be given at this time, our higher dimensional friends, families and soul expressions focusing their light and energy with the Earth’s Shift share these photographic representations along the way as an affirmation of their continuous supporting presence throughout this transformational process. As the overall background vibration in, on and around the Earth continues to rise (which we can feel and attune to through our peaceful hearts while keeping our energy free of the 3-4D power-play of distraction and diversion) the crystalline soul collective(s) connected with Gaia and the New Earth light-grid are also heightening and amplifying energetically, which we’ll talk about in more detail in the next post. For now, tune in with the Earth, with Gaia Soul, open lightly to her heart to heart, and align (with) the vision and inner knowing that her Crystalline Heart is radiating like an inner diamond star, sending fluid light currents through the planetary network of meridians and nodes, through the crystalline heart grid, nourishing the unified consciousness qualities that are being anchored and amplified through the crystals of the Earth, interdimensionally, and vibrating through human potential…translating into loving thoughts, feelings, words and actions wherever inner resistance has melted into trust. The Aquatic star beings support the Earth from above and deep in the oceans, where they harmonize tectonic movements, the sea floor, and water contamination (literally harmonize, with subtle sound frequencies, ‘toning’ the planetary sound-frame). They radiate the vibration of melting hardened resistance into love; where there are harsh energies, letting go and letting them dissolve into softness. Where there are discordant tones pulled out of the inner harmonic resonance we experience as feelings of well-being, peace and love, resolving-through-dissolving into vibrant sacred geometries of sound, tonal streams flowing like the gentle refreshment of pure, sparkling water. 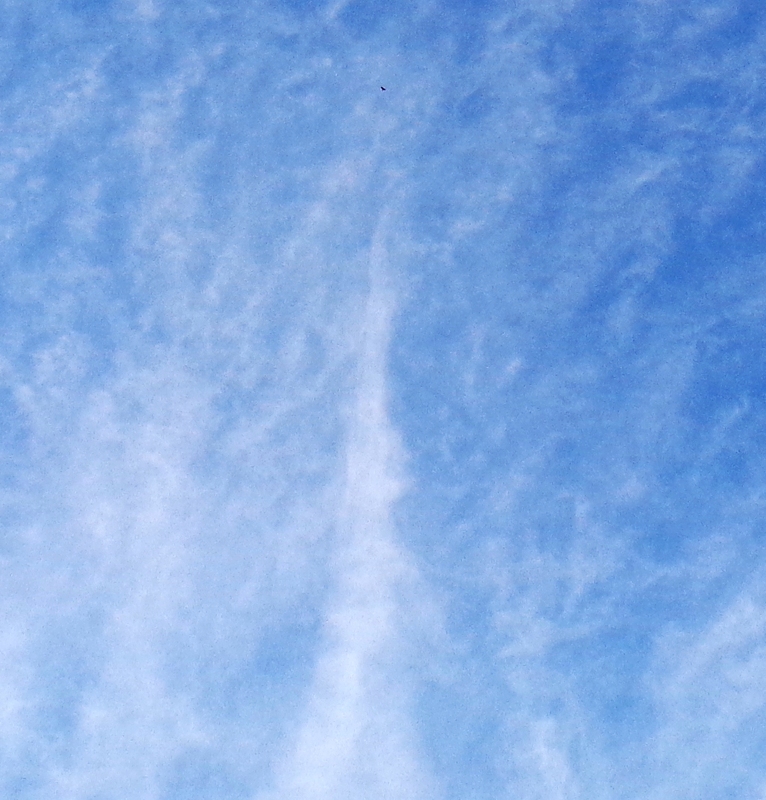 Our Aquatic friends gave a beautiful depiction of this ‘resolving-through-dissolving’ above a local walking trail here on October 15th, calling my attention to a small plane passing in front of a little clump of cloud in an otherwise clear sky. As the plane flew by, a triangle shape ‘opened’ in the cloud. The energies felt suddenly heavy, with the presence of less than friendly beings attempting to open a portal (transdimensional opening). Immediately, star family focused in around the triangle, with faces forming in the cloud. As the cloud drifted higher and the plane flew away, a white-light pod ship flashed above the cloud (circled in this photo, with the plane circled at the lower right of the frame). This ‘dissolving portals’ theme continued into the evening of October 17th, this time with the Meri’Ashar overhead, the ship’s presence at first softly presenting just beneath a huge blue-violet orb between the Moon and Mars. 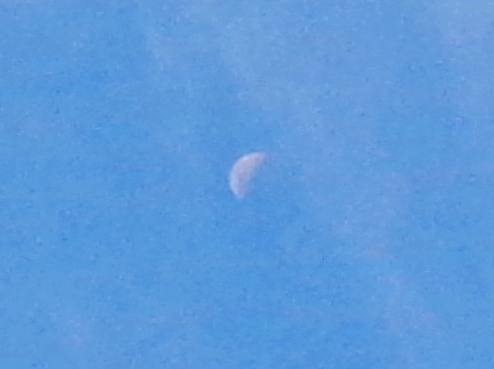 Once again, as clouds moved across the Moon, beings of the lower Mars energies attempted to open another portal, represented again as a triangle opening in the clouds (upside-down ‘black triangle’ with one tip touching Mars, and the other side clearly defined against the Moon’s light). 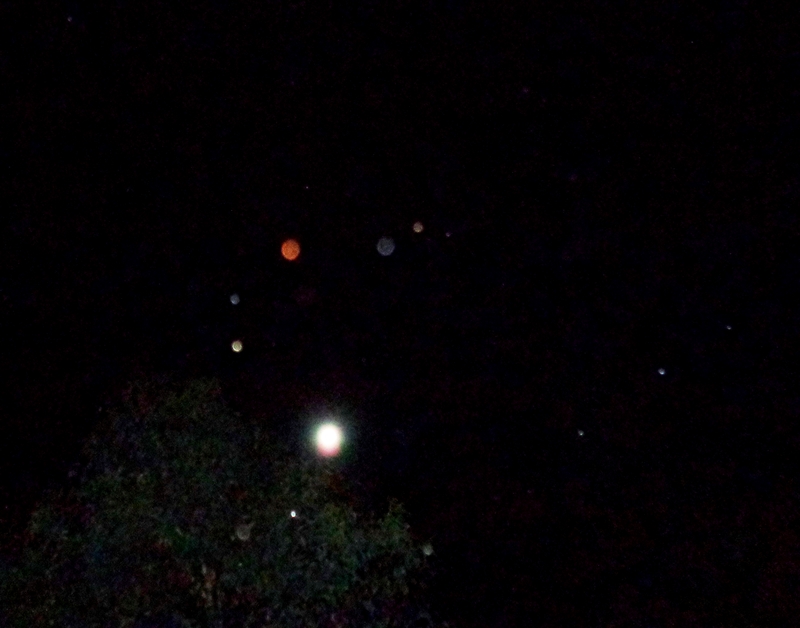 Three orbs aligned directly below Mars as the clouds dropped away (with a disc hole in the cloud directly beneath the Moon). As clouds moved over again, a second triangle could be seen opening below the Moon, and the lightship Meri’Ashar showed as a bright white light stationed in front of it, while a sister ship, the Sophia/White Phoenix ‘high lighted’ the Moon from behind the clouds, as they transmuted heavy energies together and dissolved the portal. 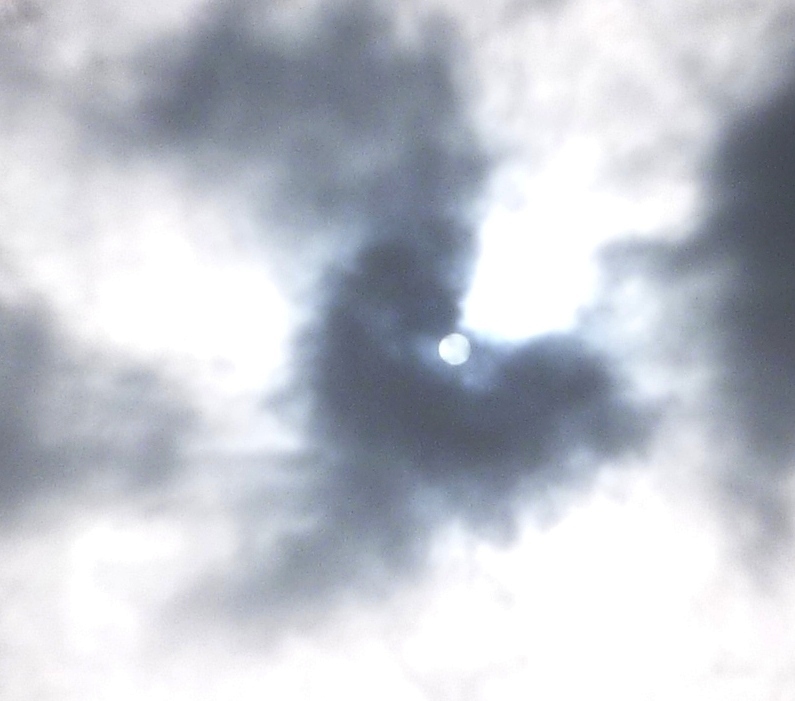 The clouds around the Moon condensed inward and resolved into a beautiful loveheart radiating pure high frequencies, with a duck-like shape to the upper left, positioned as if flying into the heart. In animal symbolism, a flying duck signifies spiritual freedom…and as a waterbird, in that moment it represented the act of diving into Love! After this resolving of energies, the clouds cleared away completely, with the Meri’Ashar keeping watch for a while close to Mars, sending a light pulse through the alignment between Mars and Moon. While attuning with Rowena&Arnap (5D soul expressions on board the Meri’Ashar), Mars/Aris appeared within my inner vision as a luminous flower surrounded in peachy golden petals of light, with a blue-green flame in the centre, rebirthing his sacred heart. If ever you’re ‘feeling at sea’ with some of the heavier energies swirling in the Earth’s and humanity’s collective vibrational field, or further afield, just take a duck dive into your heart of Love…and know that there are guiding Lights within and around this planet constantly dissolving attempts to undermine the Shift, and these Lights are radiating and streaming the same Love that lives within you/us all, it’s all one flow we’re circulating together, and at the heart of this circulation is pure boundless joy! As mentioned in the previous post, the crystal soul collectives are assisting in heightened, very precise (and precisely coordinated) flows through this month and beyond, with the ‘green-blue’ family of Green Flourite and Green Aventurine much to the fore through October, joined now by the Aquamarine beings…transitioning from this Full Moon today/tomorrow through to the 11-11-11 Gateway (November 11th 2018), into Deep Blue and Golden Light frequencies. The vibration of Aquamarine melds the green spectrum into blue, with a serene clarity of inner touch that relaxes and opens full receptivity to the Golden Christing/Restoring Light, bathing the inner child within each of us that is the seed of our co-creation of, and in innate harmony with, the New Earth. As our Aquatic friends say: Let go, let glow, let flow, be free and Rise in Love. Some of the crystals in a node here, green and blue, flowing through to golden, with the faces of some beautiful crystal beings showing through an enlargement (upper right) of a piece of Aquamarine, sending love and ‘peaceful play’ to all. Greetings in the midst of May. 🙂 We’ll be posting an update about the New Earth Grid soon, and how the overall energies are shaping ‘up’, but will take a little pause (paws!) here for a moment to bring into focus a stream of the Leonine Light that has been quietly cradling and stabilizing the Earth’s subtle and physical planetary field continuously through the great Shift of vibration and consciousness currently in progress ~ here on Earth, throughout the Solar System, and on a wider galactic level. In the past few weeks, an amplified flow of the Mother Star Sirius has been bathing the Earth and Solar System, honed to particular node points of the Earth Grid through the lightship Sophia (see previous post). 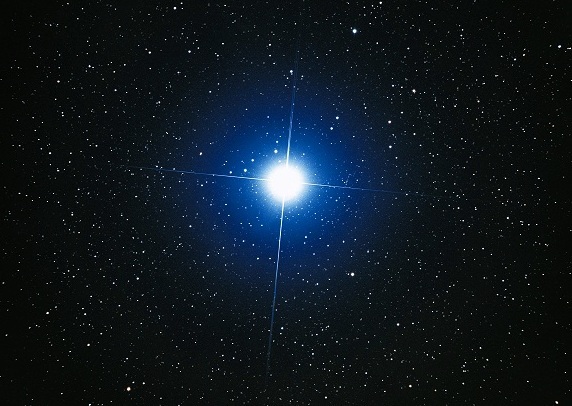 Flowing with the Sophia are many beautiful higher dimensional lightships of the Leonine and Feline beings of Sirius and Antares, whose origins in this galaxy go back to the constellation of Lyra and the first galactic federation…and beyond that, to other universes. The Leonine ship most often flowing its vibration around the area where I live is named the Shem’Arua (Light of the Lion), a large disc-shaped lightship which you can find more about on the Shem Arua page. This ship is captained by a wonderful, loving White Lion Twin Flame pair, Altara and Arudia. They have at times projected their awesome light-forms around the garden here, and appear visibly as shining white orbs in the house, when we’re connecting and communicating together. Their faces ~ and those of other lion and feline beings on board the Shem’Arua or associated ships ~ often take shape overhead in the clouds, signalling their close presence, frequently forming around or close to small ‘pod ships’ flying out from the Shem’Arua on various energetic assignments, often in a protective guardian role, transforming dense energies in this area (and all around the planet). Faces of Sirian feline beings, overlaid by a large white lion face (Arudia), shortly before a pod-ship appeared, April 16th, 2018. Their pod ship first flashed as a tiny pinpoint of light directly beneath a small cloud with leonine faces softly forming in it. Tiny white pod-ship flashes below a cloud, April 16th, 2018. As the ship flew lower, in front of a thicker bank of clouds, its appearance became more defined as an elliptical-shaped silver-white lightship. 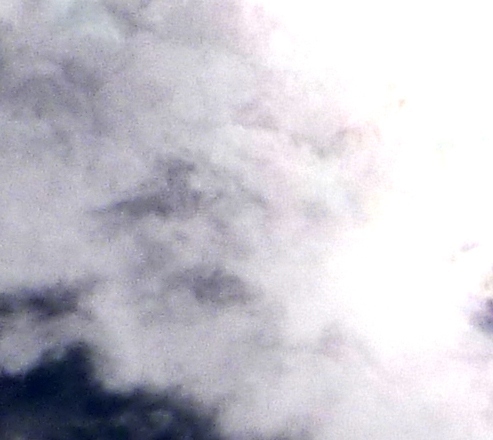 Leonine pod-ship flies in front of clouds, its elliptical shape clearly visible, April 16th, 2018. Enlargement of pod-ship, with contrast enhanced. More beautiful Feline and Leonine beings formed clearly in the clouds three days later, radiating so much Love, and they share this with all humanity, who they love dearly. Large-eyed feline being, April 19th, 2018. In the centre of this photo there are two merged feline faces, one looking downward to the left, the other looking upward and right. 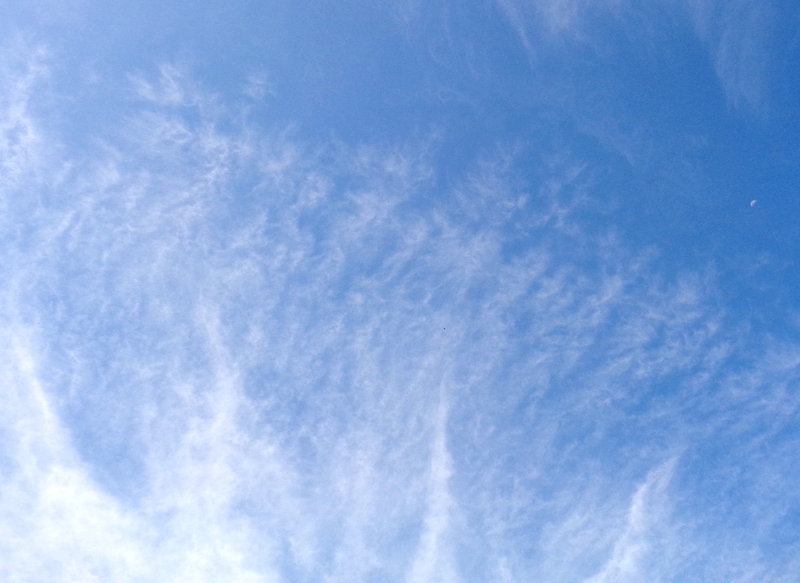 Can you see the sweet heart-shaped nose of the white feline looking upward, in the centre of this photo? Two feline merged faces with many others around them, April 19th, 2018. Relax, breathe, and let yourself feel and appreciate the heart-warming, soothing, strengthening inner purrrr of the Lion Star Family gathered around this planet, dear friends of the ascending Earth. Stay steady on the course, and know that all is on track in every moment, as you/we continue to anchor unconditional love and unity, for all. And we’re also happy to announce the release of an ‘ascension assistant’, the Inner Divine Essence, which you can find out more about at Heart Star Essences if this resonates for you. 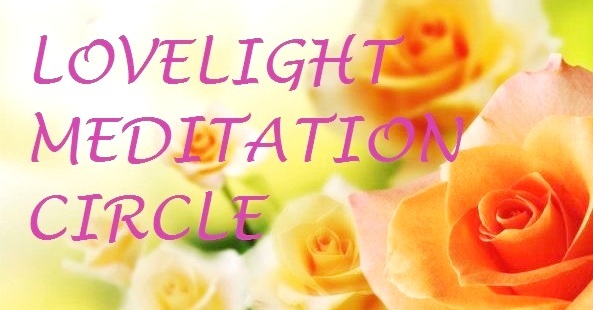 PS: Today’s 11-11 DNA Activation meditation for May is available in this post at the LoveLight Meditation Circle. PPS: More about Lion Beings can be read in The Winged Lions of Eremor. The energetically ‘full’ month of April has come to fruition with a very beautiful Full Moon, that is peaking the vibration of inner reflection, inner awareness and deeper release where the ‘local self’ holds onto or continues recycling personal identity beliefs and views that cloud or disrupt full, consistent ease of alignment with the Inner Divine ~ the ‘higher self’s’ merge of subtle light, wisdom and perspective into this localized focus point we identify as ‘I/me’ that allows us to be an Unconditional Love Anchor in every moment, regardless of energies around us. This gift of going deeper into recognition, trusting and relaxed in the light of loving compassion, extending it to all, opens the earthly form (physical, mental and emotional) which we’re expressing through to receive and integrate divine Light flows/codes/activations to their fullest as they bathe the planetary field in a precisely coordinated sequence from the Heart of Source, through higher dimensional realms of peace and love, into the 4-3D fluctuations, gradually ‘shifting and lifting’ the quality of the vibration around Earth into blissful unity. Many beautiful, dedicated beings of Love continue to assist and guide this Shifting sequence quietly behind the scenes, mostly invisible and immaterial, yet immensely present with every moment of this planetary, collective process. At particular moments the Light of a being or group among the wide array of star family and infinitude of high Light beings supporting this transition phase shines to the fore, in connection with particular Light flows, amplifications and activations. With this Full Moon, bathing the deepest held personal self-beliefs and limiting attachments in a ‘triple divine pulse’ immersion of rose and white light frequencies of universal love and the clarity of universal wisdom, Immara ~ remembered by the name Isis on Earth ~ is to the fore, radiating her Soul Light, with many lovely beings of the lightship Sophia, the White Phoenix. The Sophia vibrates through the sacred angelic symbolism below (the energy of which was imprinted as a crop circle a few years ago), as a ship of white light filled with soft, warm rose ~ the nurturing, warm unconditional loving energy of the Divine Mother aspect of Source. 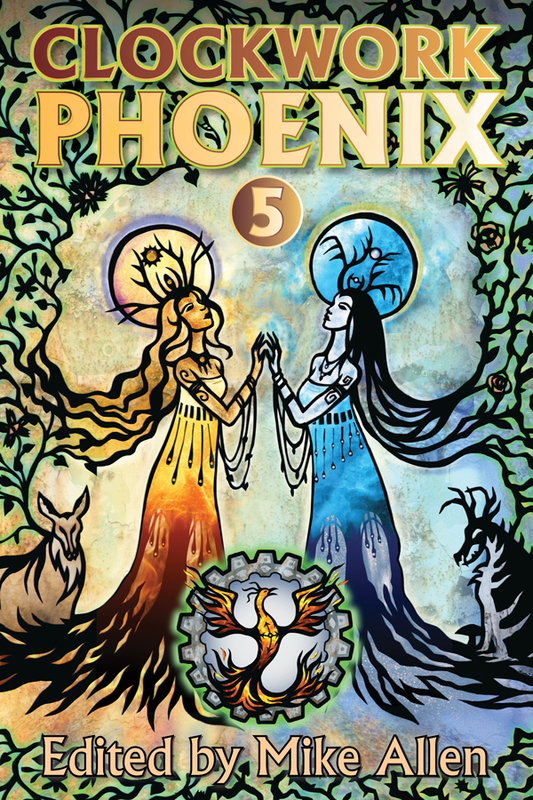 Immara (Im’Ma’Ra – ‘divine grace of the mother Light of Source’) focuses her Light with soul family into the 5D level, radiating through and from the White Phoenix in unison with the Phoenix (the golden lightship Ashtar focuses his Light through), one energy flowing through white and gold twin ships. Through the current Full Moon, a sequence of three high Light pulses are flowing into and around the planetary energy field, in the rose-white vibrational attribute of the Tenth Ray ~ pearlescent pink-white light, transmiting integration of peace (the Tenth Ray has been amplified from April 25th and is being integrated through these three pulses). To assist with attuning to this Light inflow, star family ~ and specifically the Sophia ~ gave these photographs last night. In the first, a huge rose-gold orb hovers just to the right of the star Sirius (with which Immara has a strong connection) and Orion below, where Sirians have assisted with a lot of clearing and restabilizing recently, with a decloaked Sirian lightship above the orb. In the second photo, you can seen more of the ‘form’ of this ship as it phases through to the fourth dimension for a moment. 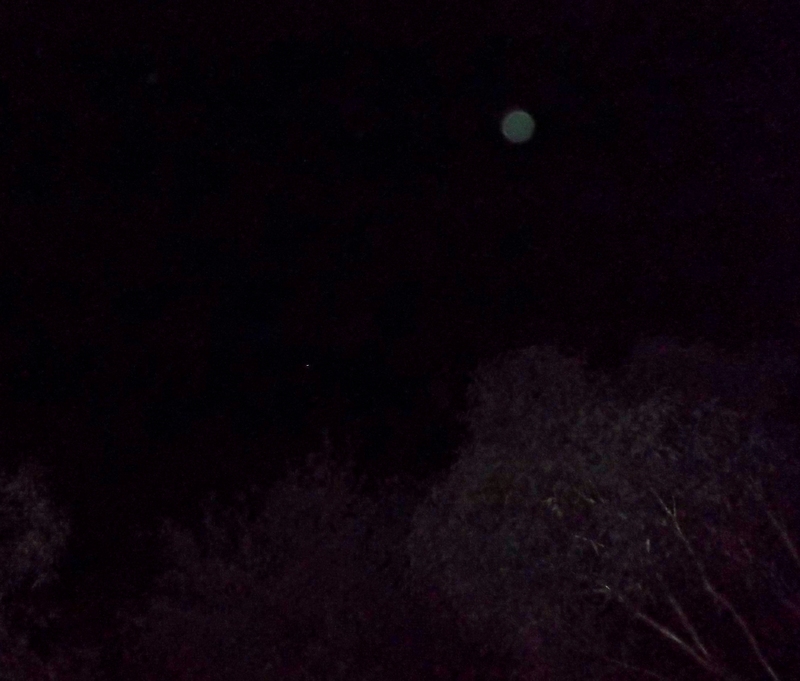 Rose-gold orb left of Sirius and above Orion, with Sirian lightship above the orb, April 29, 2018. 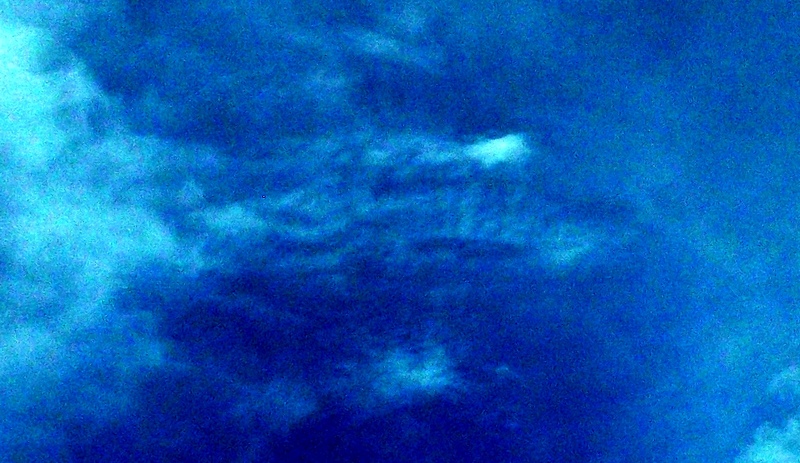 You can see in this photo a small triangular pod-ship (sometimes referred to as scout ships) returning to the mothership, it’s ‘Sirian blue’ light more visible in the second image, with contrast enhanced. Later last night, when the moon had cleared the treetops, three small aircraft flew overhead, and each time, a pod-ship skimmed around the plane, making its presence known. Here’s the first; there was a brief flash of light behind the small plane, and by the time I took a photo, the ship had passed in front of the plane. In the enlargement, its white and rose glowing light can be clearly seen, akin to and emanating the vibration of the Sophia/White Phoenix, from which it came. In the second photo, Jupiter is the bright light near the top of the frame, a plane is flying through the middle, with a small ship below. 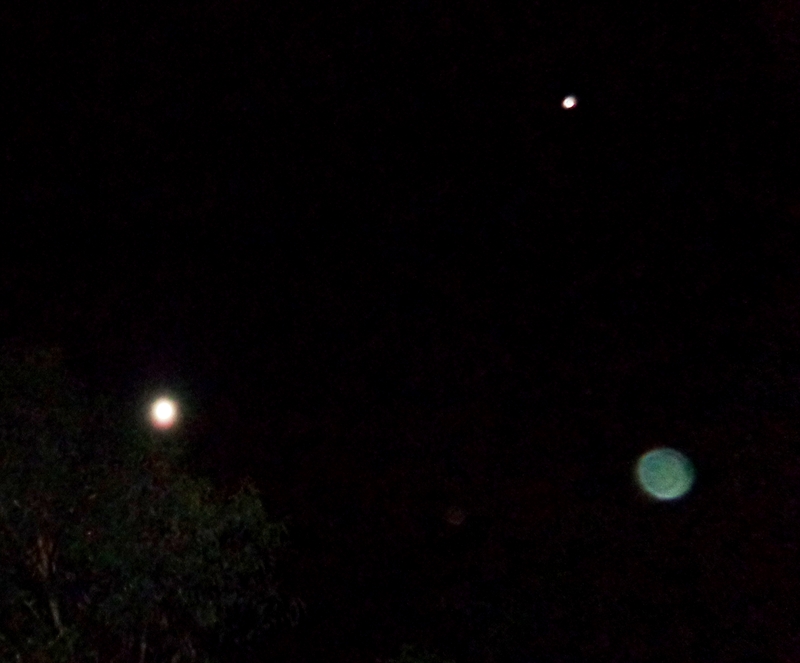 And thirdly, another plane heading east that was tailed by a flashing lightship. Small plane flying east with a flashing pod-ship directly behind it, April 29, 2018. Feel the deep resonance in the symbolism of three planes and three lightships flying east (toward the dawn) with divine trinity energies and the dawning New Earth. The rose-white light continues to flow and will settle in more deeply through the magical month of May, in numerous ways, through many clearing and opening avenues. To stay open and in tune with this glorious light-flow and the Peace Integration of the Tenth Ray at a deep level, choose to stay in peace ~ with yourself, with those around you, with all of humanity and all living beings, in peace with the entire planetary ascension journey, which from an expanded perspective, occurs in the blink of an ‘I’. Keep it simple, keep it clear. You are/we all are beloved of the Source radiating, expressing, glowing as the pulse of Love through us and all Life. * See this post for more about Immara/Isis, this one for an introduction to the Tenth Ray, and this post for an orb photo of Immara in her Isis energy. With the closest full moon since 1948 (known as a ‘supermoon’) on November 13-14th 2016, we’ll start with a follow-up to the previous post about the 11:11 ‘Gate’, which saw a high peaking of ‘rose-gold light’ around the Earth. From a higher dimensional view, the Sun has shone this light through, the Moon has reflected it, the lunar portal has flowed in connection with Venus energies and beings. The rose-gold light theme showed through during the preceding week in Venusian/Hathorian ships of that colour (see previous post), with orb and lightship alignments to Venus and the Moon. 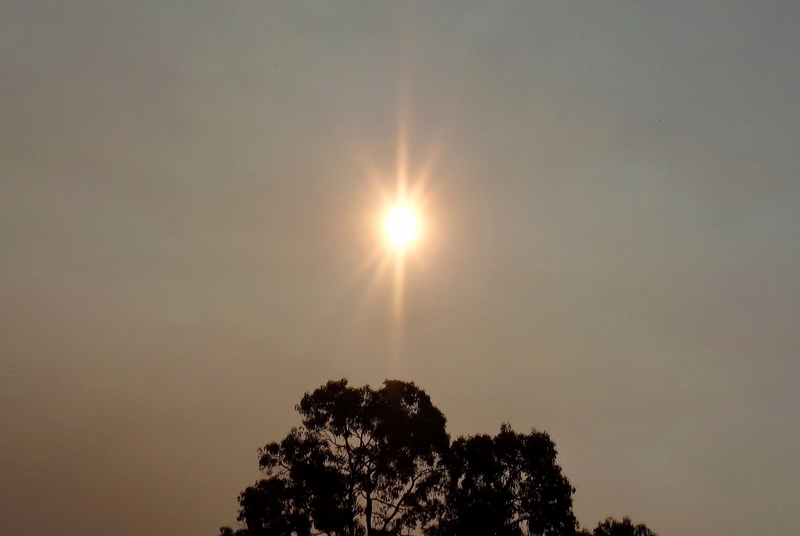 The day after posting about the 11:11 Rose-Gold Gate, the sky here was thick with smoke, through which the Sun appeared with unusual rays tinged rose-gold. The Sun appeared ‘rose-gold-rayed’ through smoke on November 4th, 2016. 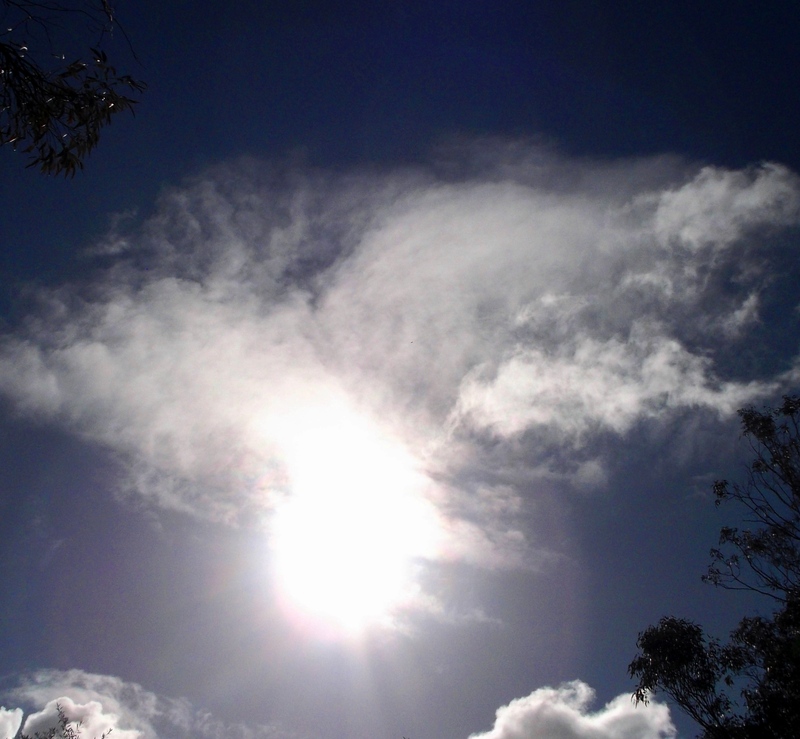 This spectacular Sun was followed a few days later by an equally unusual and beautiful daytime Moon. 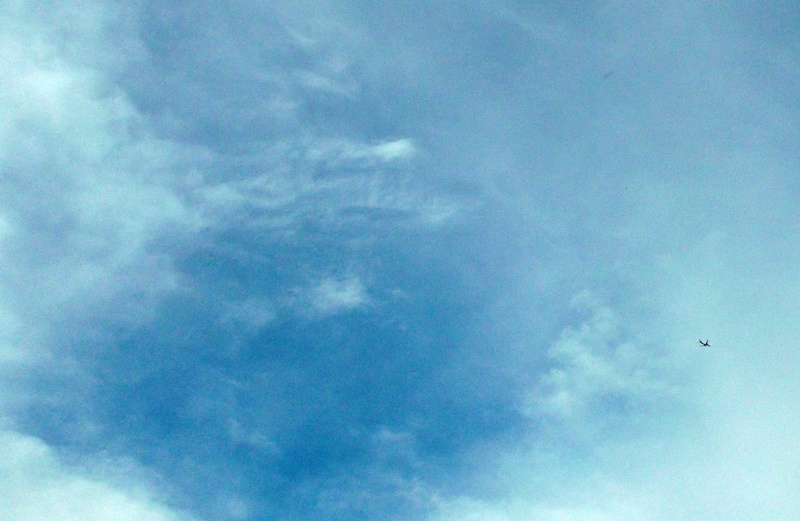 I was ‘called’ outside, to see an Eagle hovering over the house. Hawks pass over quite often, but Eagles only a few times a year, and they are always a signal to ‘look up’ and connect with star family. 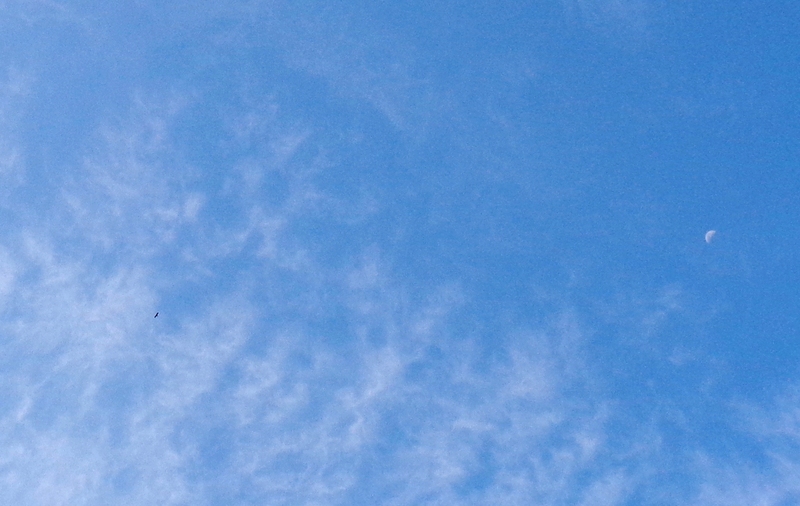 Here is the Moon on the afternoon of November 7th, with the Eagle flying nearby. Eagle flying to the left of the Moon, November 7th, 2016. 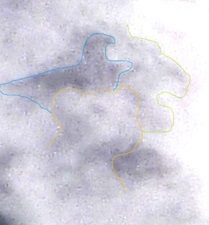 As it circled, four ‘cloud pillars’ formed under its path, reaching upward in the clouds. Cloud pillars form beneath the Eagle, November 7th, 2016. Here’s the Eagle hovering above the most upright pillar, representing star family guiding/protecting the rise of the White Flame of Ascension. Eagle above white cloud pillar, November 7th, 2016. A pair of hawks also appeared and circled around the four pillars, then the Moon went to a pink tint, like a white crescent cup containing rose light. Moon turns pink inside, November 7th, 2016. As you can see/feel, the symbolism running up to the ‘rose-gold peak’ on November 11th was visually precise and beautiful, and continued the next night with these two lovely orbs of rose and peachy-gold, with many light beings present in and around them. The completion of this particular clearing symbolized beautifully again in the sky on the following day, November 12th….where we can see the process of cleansing/releasing/transmuting the density of the ‘veil’ around the planet, for again the sky was wreathed in smoke. I went outside and connected with several ships directly overhead. 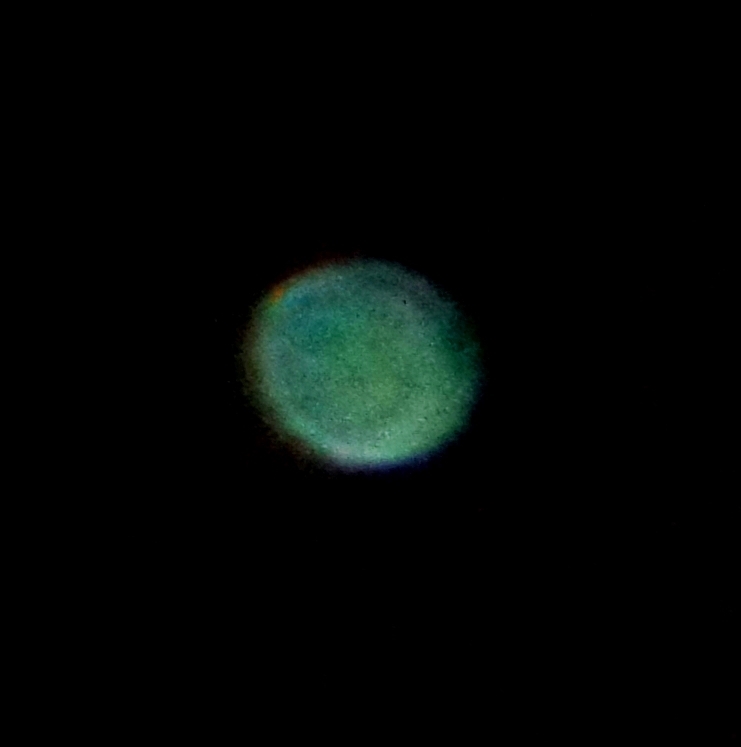 You can see the clearest of them in the enlargement below, its disc outlined in the smoke. Layers of smoke in the sky overhead, November 12th, 2016. 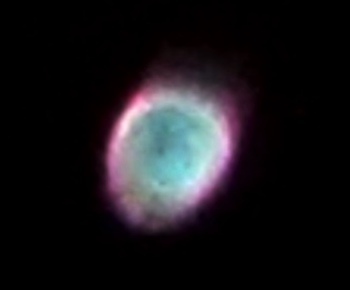 Enlargement, contrast enhanced, showing a disc-shaped ship in centre, November 12th 2016. Although this was the middle of the day, not sunset, the smoky layers mixed with clouds began to turn pink. Then the veil of murk peeled away from in front of the Sun, and this photo really shows the dynamic of the energies at work. Within a couple of hours, the entire sky was clear and blue, not a cloud or wisp of smoke left, as it completely dissipated, layer by layer. So feel this on a personal, planetary and collective level: is your gaze – your perspective, thoughts and emotions – turned to, clouded by, the smoke-screen of the Veil, the smoke and mirrors games being acted out in the duality drama, whether in your individual, group or collective ‘reality’? Are you attuned to the light of Universal Love, which can appear to be ‘screened out’ from view or touch, ruffled or disrupted by fear-based energies…yet is always present in the soul spark seated within your Inner Heart? If your heart star is shining through your BEing fully, you will feel it in your ‘earthly self’ as joy, well-being, peace, softness, inspiration, ease of connectedness, no matter what is going on around you. Personally, I did quite a bit of transmuting of a little ‘tremor’ that surfaced from a deep subconscious level last week…bathing in the rose-gold light, in the rays of Divine Love, until it all cleared. The rose-gold light has ‘bedded in’ now, and can be visualized (see meditation in previous post) and held in and around you, with the intention of transmuting any little dark clouds or smoke wisps in your own energy field. It truly is a joyful, warm and deeply comforting light, an embrace of Source in the expression of Divine Mother holding Divine Child. Now, at this moment of Full Moon, tune into the Mother Rose energy, and we suggest holding an image of the Fruit of Life in your heart centre, while tuning to the sphere of this Moon. Feel your heart centre as the zero-point, through which the ’13th Sphere’ (Mother energy) flows as a rebirthing, into a new spiral that goes beyond the frequency level of ‘polarizing’ into ‘merging’. Connect with this ‘flow of the Rose’ through the higher dimensional lunar ‘portal’. This is how the Supermoon appeared from here last night, radiant and rose-ringed, with a slight ‘crescent’ or ‘cow-horned’ light refraction above. Rose-ringed Supermoon, November 13th, 2016. We’ll write more soon about the Hathors (‘Hathor’ was depicted as a Cow-headed goddess in ancient Egypt), their connection with Immara/Isis and her lightship, the Sophia, with Venus and the stars within the Taurus constellation, as their presence is touching the Earth again now more deeply than for a ‘long time’…along with so many soul families and groups of pure Love. 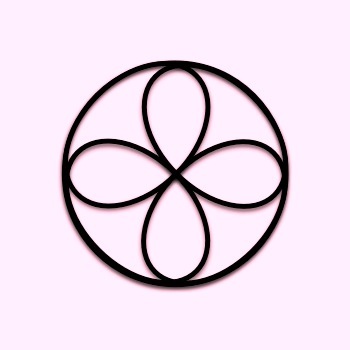 We would also like to give a heads-up (or ‘hearts-up’) for November 22, as the Rose Cross form of the ’22’ as double infinity energy is particularly strong this month, within the ‘rose-gold theme’ light flow. Feel how the Double Infinity within the Ring flows from the centrepoint and back into the centre continuously ~ the infinite motion of the spiral of the Divine Feminine around the axis or arrow of the Divine Masculine, in ever-expanding creativity of Source through all dimensions, universes, all imperishable sparks that ‘individuate’ as souls (Oversouls extending Source energy of love through myriad soul aspects) like droplets in the eternal ocean of Life. 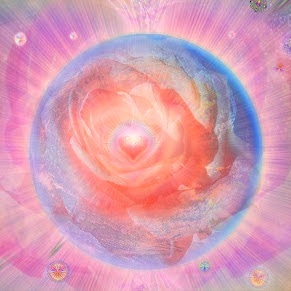 Let the Rose within your heart, the seat of your soul, open and embrace the full creative Light of beloved Sirius. Let it stream into your being through the ray of Blue, through the protecting arch of the Sirian Blue Lodge, which carries and transmits the cradling, loving energies of the leonine and feline beings who came as winged lions long ago through the Lyran and Eremor Portals and created a beautiful feline haven on the planet Toleka of Sirius A. 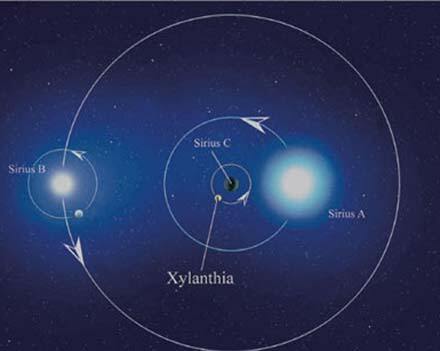 The Sirian system also carries the ascended humanoid blueprint of the people of the planets of Sirius B, and the deep, abiding joyful love of the dolphin, whale and merfolk of Sirius C, a higher dimensional star not visible in 3D, but which is the bright hub of oceanic liquid light planets that complete the trinary system of Sirius, the triangle of harmony, the trinity of human angel, leonine and cetacean united energies. 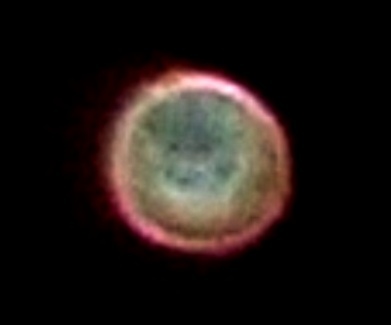 Blue Lion orb with Angelic energies, July 30, 2016. Blue leonine love wrapping around us, held in the pink rose of the Mother, the violet of transformation, the white protecting Angelic light. And this one, with a lioness’s face in green healing, coming through the red light of ‘landing’, of bringing healing to the base, the foundation, fusing into it the Mother rose light. Sirian orb of Lioness and Angelic divine mother energies, July 30, 2016. The photo below was taken on June 16, 2015, and the Whale beings within come forward now again with their huge capacity for easing stress, easing strain, around the planet. Whale being ship from Zailanta’ha, Sirius C, photo taken June 16, 2015. Enlargement, contrast enhanced, with whale forms visible in their liquid lightship. Feel how they swim so effortlessly, in calm joy and well-being, through the liquid light of this ‘ship’, which is projecting here from Zailanta’ha (sometimes rendered as ‘Xylanthia’), their light-oceanic home planet of the star Sirius C.
The Sirius trinary system, artist unknown but appreciated. From the Whale beings: Remember you are the drop and the ocean, you are the particle and the wave, simultaneously. Condensed form IS, for so long as you wish and purpose to hold it so, foam upon the wave of Love, Light, Life. For so Love is born, into form projections, expressions, extensions…such as we are…the foam, the spray, the drop, the ocean, everlasting. No-thing is ever ‘lost’. Merely the projections shift with the play of wish and purpose. When aligned, with the Wave, the shifting is calm, in joy and peace, without fear, strain or grief of that which diverges. From the Feline beings: So shift with the Wave, dearhearts. We are with you, here again as the frequencies converge. Close your eyes, trust your soul, breathe the light of our Star within your inner Star, and feel us on and around this Earth again. We love you. Healing IS. 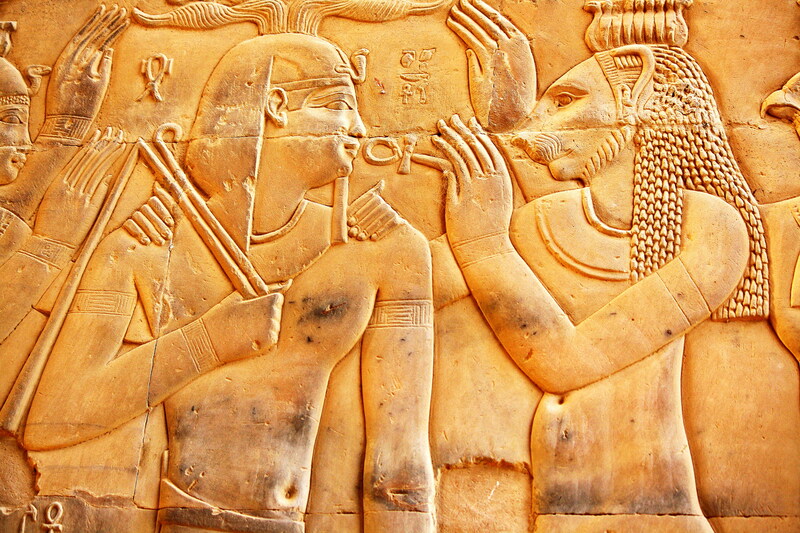 Female leonine being gives healing gift of Life through the ankh, wall relief Kom Ombo, Temple of Isis, Philae. The Rose of the Divine Mother aspect of Source blooms within the arch of blue, the Blue Ray spirals, lifting the resonance field of the Earth now. Focus now in alignment with the beautiful mother souls of Sirius, with Sesherat (Seshat), Bastet and all the leonine and feline beings, with the Cetaceans, and with the Angelic souls who went into human form in Sirius, such as the beautiful Immara…Im’Ma’Ra, whose name means Divine Grace of the Mother aspect of the Light of Source – known the the ancient Egyptians as Aset, whom the Greeks called Isis. Winged Isis brings healing on the Arch of the Rose Moon, with Sirius shining above, artist unknown, image via Crystalinks. On this day of the 8+8 double infinity, please join us in anchoring the sacred template of the Rose Cross on Earth. Wherever you are, envision it, feel it, beneath your feet, in blue and pink light, and let its form radiate outward to envelop the whole planet in the healing of the merged and balanced Divine Feminine and Masculine, solar and lunar, particle and Wave. Feel the light moving continuously throughout the Rose Cross. Trace the way the energy moves, with your mind, with a finger in the air or drawing it in the sand. Feel the Infinite Motion, which is Love in action, everlasting. Four is Love, the foundation is made. And so it Is. PS: This crop circle was reported on July 22nd, 2016, in Wiltshire UK – with feline and angelic symbolism merged (also Venus/Quetzlcoatl symbolism, which is connected with Immara). PPS: If you’re finding it challenging to stabilize your centre/heart energies right now, see the Heart Infinity Practice from Sesherat on the Practices page. I’d like to share a series of photographs I first posted in 2014. Today I’ll go into detail about what they represent – what has occurred since mid-2014 with the planet Nibiru – and will speak about them in the context of what we on Earth individually and collectively energize with our focus, thoughts and emotions, and in the context of actions by our star family of the Ashtar Command – which holds the position of vanguard of the Intergalactic Confederation. I’m sharing this now because the ‘planetary threat timeline’ of Nibiru continues to be invoked in the alternative media/community, without understanding it presents no threat and has not been on a trajectory that can connect with Earth in the planetary ascension period we are currently engaged with for more than a year. Much has been written about Nibiru, so I will just state here in brief that yes, it does exist, as a 4D planet that was established as an outpost by degenerate reptilian hybrid ET factions who unintentionally locked the planet in a space-time ‘bubble’ while feuding among themselves, and in the process depleted their atmosphere, among other imbalances – and have looked to other sources, including Earth, for substances to refresh it. At a time during mid-2014 when Nibiru reappeared in alternative media, I attuned with star family about it. Along with verbal communications, over a period of a few months they gave some very precise visual information, which I’ll share now. The first ‘asking’ (does it actually exist?) brought back a ‘yes’ that was visualized really spectacularly on June 6, 2014, with the clouds that day forming into the shape of a giant rolling moon or planet. It was so huge I could only capture part of it in a photo from the tree-filled valley I live in, but you’ll get the general idea. 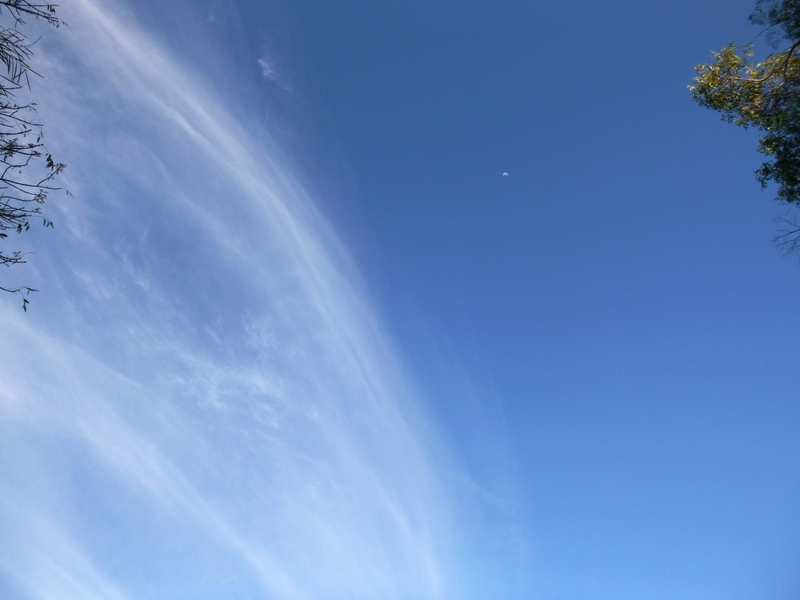 The small white speck midway between the cloud and the tree on the right is the crescent Moon, which will give you some idea of the scale of this ‘cloud-planet’. Photo taken June 6, 2014: giant ‘rolling ball cloud Nibiru’ with the crescent moon as a white speck to the right. This sight came with confirmation that Nibiru was indeed moving on a course toward Earth at that time, and in galactic terms, was already close to our Earth’s localized space-time ‘fold’, with an objective to interlock the two planets’ specific space-times. It became very clear to me at that point how certain timelines have been evoked – and invoked – in the human group consciousness in order to use the inherent magnetism of collective focussed thought-emotions to energetically strengthen the pull of catastrophic timelines. Nibiru is one of several crisis event timelines that the collective focus has been trained toward repeatedly, harnessing group fear/anger/anxiety and subconscious disaster drama addiction (that has its roots in latent collective memories of Atlantis and Maldek) as an energetic pull for those crises. Others include Fukushima/nuclear destruction, WWIII, and global warming (which is not the same thing as climate change being activated by the flux stage of a magnetic pole reversal). Now I’d like to show you what the Ashtar Command did to dissolve the ‘Nibiru effect’ (according to their scope of intervention from the Galactic Councils ie; aligned with Source) as they depicted it in the sky on June 22, the Summer Solstice of 2014. 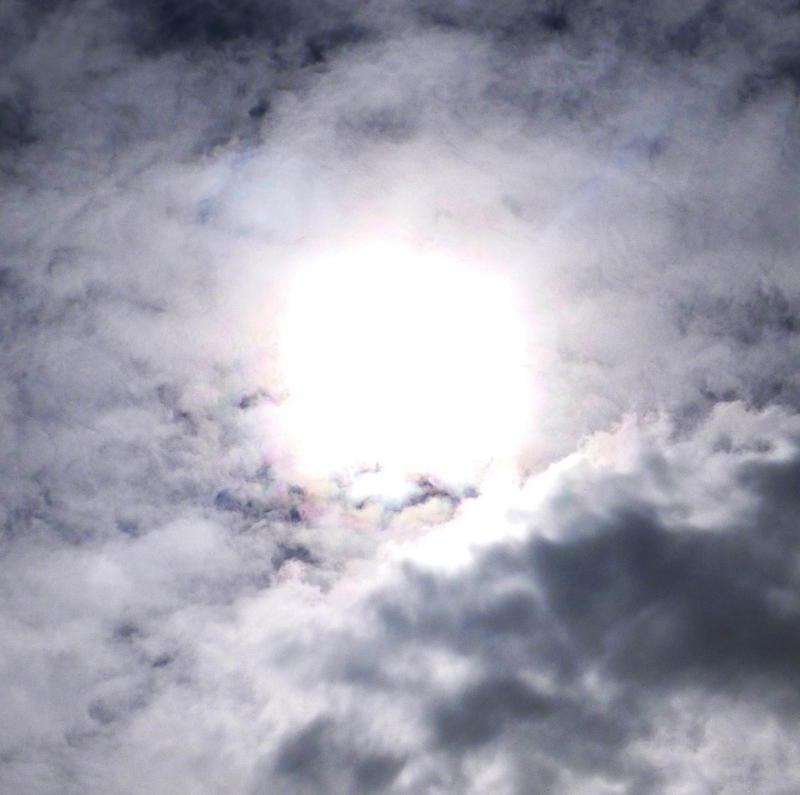 I was ‘called’ outside to look at the Sun, which was above a thick bank of cumulus clouds. The following symbolic’cloud depiction’ happened swiftly, like a timelapse sequence (this is showing energies from 4D+, not 3D linear time). 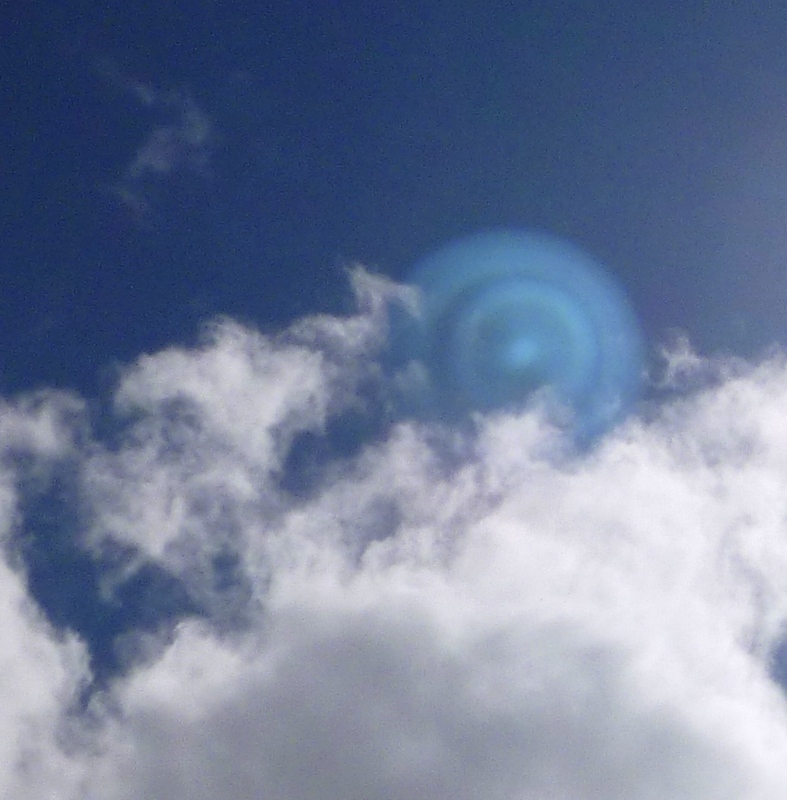 Two parallel rings of cloud formed slightly above the Sun (this signified the presence of a ship, in this case the Shem Arua, indicating the fleet’s position relative to the Sun ie; ringing around it from ‘above’, meaning higher frequencies). The rings marking the fleet’s presence lowered around the Sun, while the large swirling ball of cloud directly above the Sun and fleet intensified. 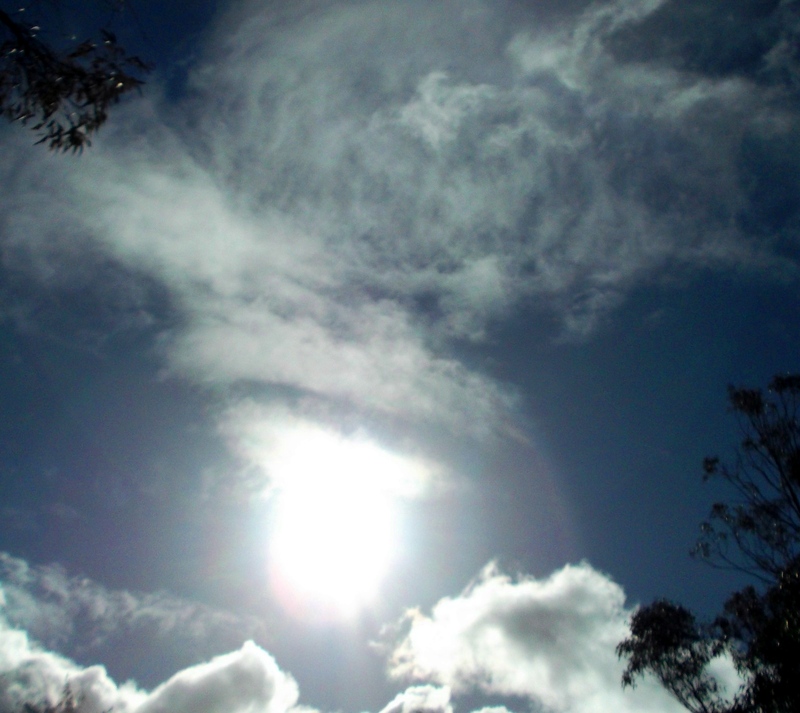 The rings continued to drop and ‘meld’ with the Sun, while the spinning ball of cloud above the Sun condensed into a thicker form. 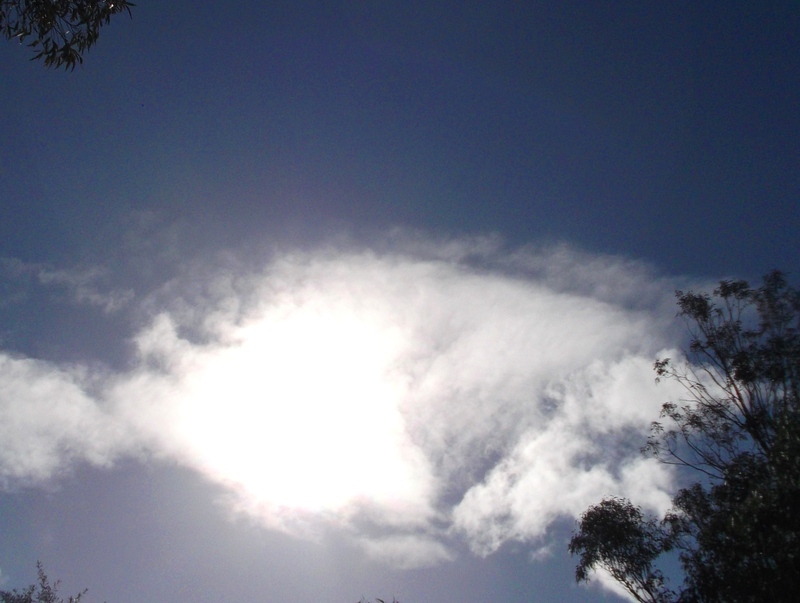 The cloud ball began to flatten as if it was being compressed and sucked down toward the Sun. 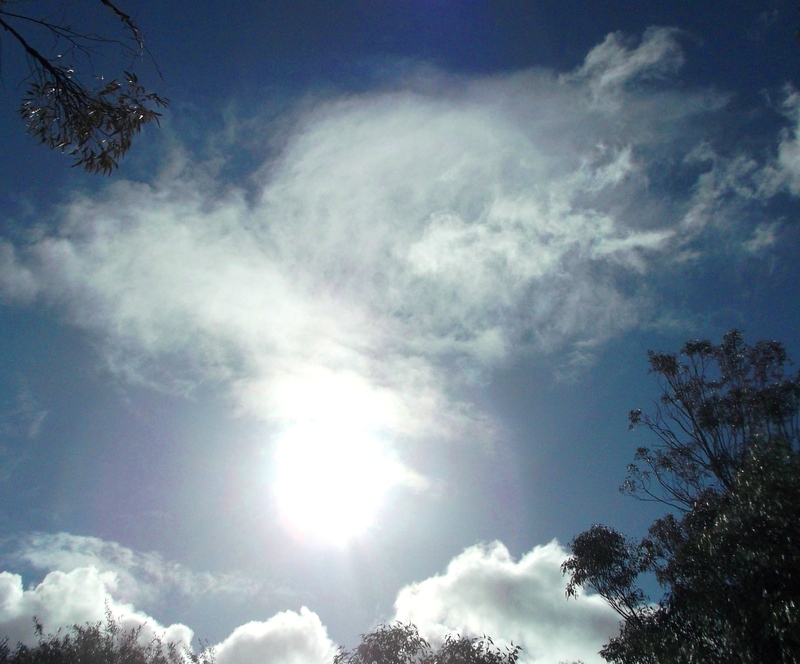 The ball shape disappeared as it kept pouring down toward the Sun, while the surrounding clouds formed a kind of ‘blanket’ around it. 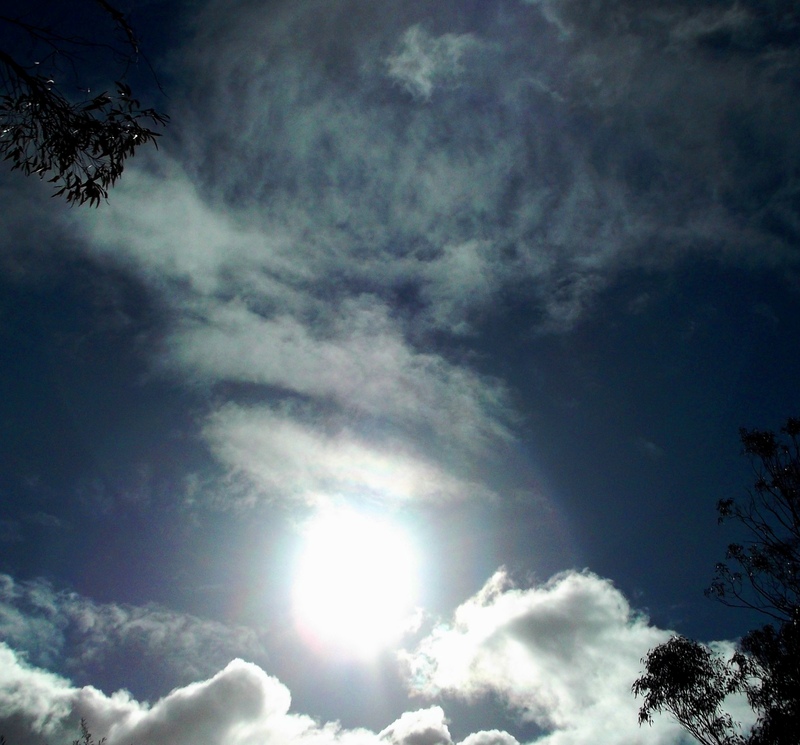 The Sun was completely engulfed in the cloud blanket, which smoothed and firmed above and around it. While watching this spectacle and feeling the energy of it from an ‘on the ground’ perspective, I was also witnessing what was being symbolized here from a higher dimensional perspective – that as Nibiru’s trajectory closed toward Earth, it was intercepted by the fleet, the planet was tethered into the Sun’s magnetic field, and sealed into that field with an energetic ‘compression blanket’, so to speak. You may recall that over a few months last year there were a large number of X and M-class solar flares, and I can tell you the fleet did a lot of work to stabilize the Sun and its magnetic field while containing Nibiru in there until it could be harmlessly ‘relocated’. Mid last year, a number of ships the size of planets were stationed around the Sun, with the focus of holding its stability. There was an attempt by control forces on August 31, 2014, to wrest Nibiru out of the Sun’s magnetic field and reignite the ‘Nibiru crisis timeline’. 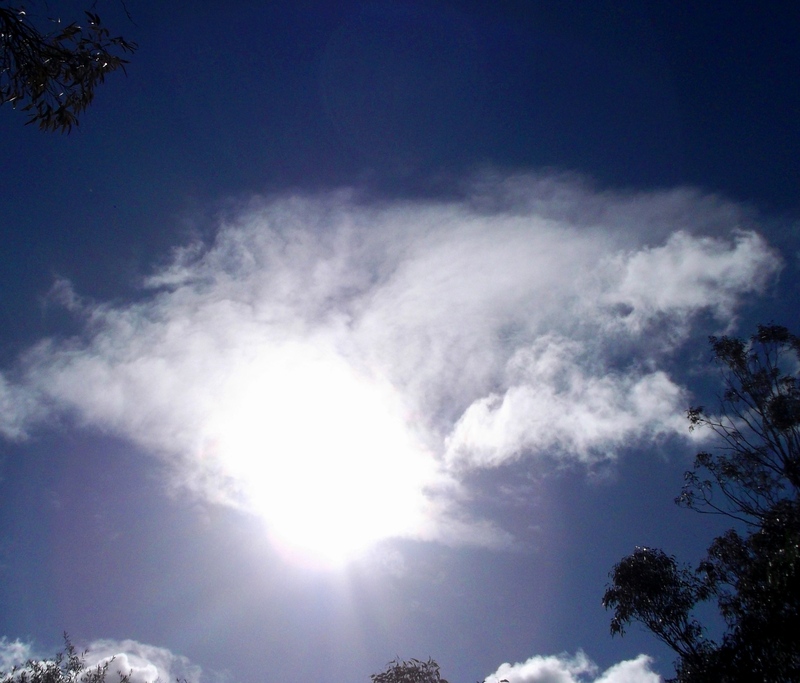 The way this symbolized to me in the sky that day was of a ball of storm-clouds that formed around the Sun, with a ‘dark angel’ shape that condensed at its centre, covering the Sun. As the Sun darkened, the attention of the fleet turning toward it visualized as the face of a lioness (Sesherat), with an eagle above her (Ashtar), and the profile of a lion behind them, all looking toward the Sun, their gaze angled upward. The purpose of sharing this information now is to show, with the example of Nibiru, that there has been and continues to be a great deal of intervention going on to keep Earth protected and intact through its Shift, and that the Intergalactic Confederation aligns with Source’s decree in acting on our planet’s behalf. Please feel deeply in your heart what we are saying here. We are each asked to take complete responsibility for what we energize, what we give energy to with our focus, expectations, speculations and reactions. What kind of ‘magnet’ do we wish to be, within our individual life experiences and the collective human family, with Gaia, with our star brothers and sisters, and all life on this planet? Do we energize ‘crisis’ in our own lives and on Earth? Do we decide daily to BE a focal point of highest love, peace and joy, no matter what is ‘happening’ in 3D, without conditions or ego projections? Do we trust our soul to know exactly what it is doing through this ‘now self’ extended into the experience of physical life? When we BE that focal point of love and trust, we are like a straw – or a prana tube – through the ‘fog’ wrapped around the planet, the human collective psyche, letting the higher frequencies flow through us, and anchor through us into the heart grid – the higher template – of Gaia. Feel it like this: as the true Light of Love flows through us unimpeded, collectively we are creating a pool of higher frequencies with Gaia, that is building and building within the fog. Simultaneously, those higher frequencies are pressing in from around the fog. Since our starfleet is charged with preserving the planet through its ascension process, the more extreme measures the control-oriented factions take to bring about a new global control order through devastation, the more they are magnetizing the intervention of higher loving beings. So feel into how both those who draw in our star family as love-to-love and those who draw them in – albeit unintentionally – by taking actions that stress or imperil the planet are, ironically, gradually diminishing the fog that maintains the illusion of separation. The Light of Love is building from the inside, and pressing around, like a compression blanket. If it keeps building in graduated steps, there will be a point where the fog totally disintergrates and the tipping point of consciousness into unity naturally restores itself. If resistance remains heavy, the compression will at some point ‘pop’ the fog band, and we’ll get more of a ‘flash ascension’ – or we could say, descension, of unifying frequencies into 3D. Either way (or maybe another way), stay in peace and keep gently aligning with joy, for your higher dimensional self to unfold within you in this Now. You are beautiful, and you are loved, always. 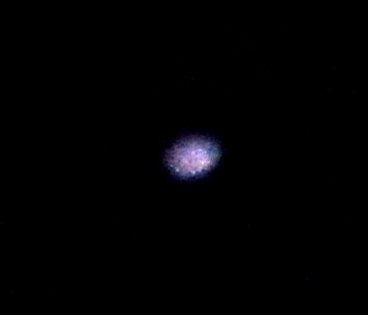 I’ll end this post with some photos I took two nights ago of beloved friends and family in Orb form, and firstly, these two small ships of a violet-purple colour I’d never seen before. They hail from Cetus, constellation of the Whale, which I’ll speak of more soon. For now, you’re welcome to read this post from last year with reference to Cetus. 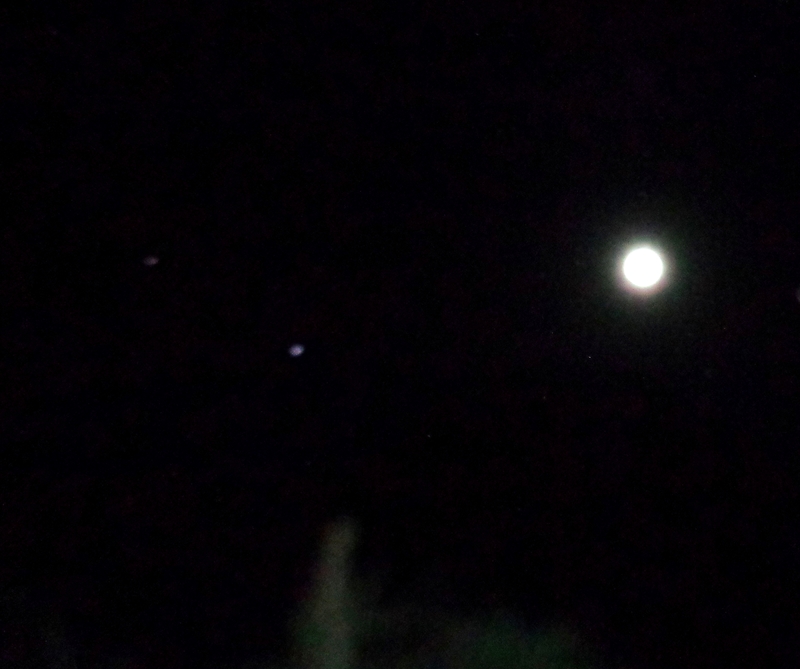 Two small ships from Cetus, taken at Full Moon on Nov. 26, 2015. Close-up of ship on the right. Close-up of ship on the left. Two orb groups, one at lower right positioning themselves in a straight line, the other forming an arch over the Full Moon, Nov. 26, 2015. My Twin Flame Ashura’s ‘Green Man’ orb triangulates with the Moon and a small pulsing orb. 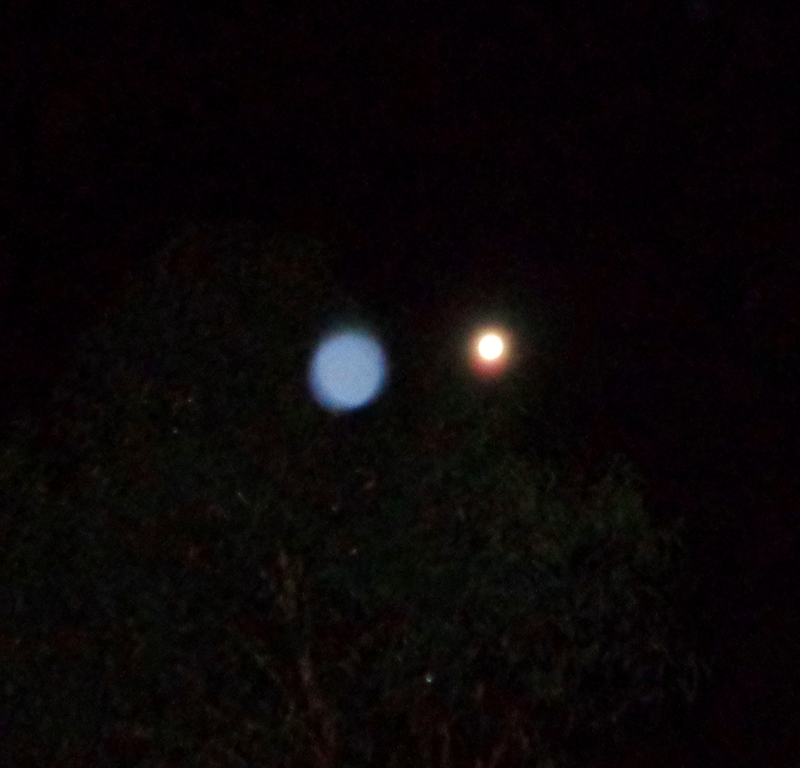 Lovely light blue orb, AA Haniel’s energy. Wishing you all a beautiful week as we go into December, in what was once the zodiac window of the Thirteenth Sign, Ophiucus (which contains a star known as the Shepherd’s Dog). 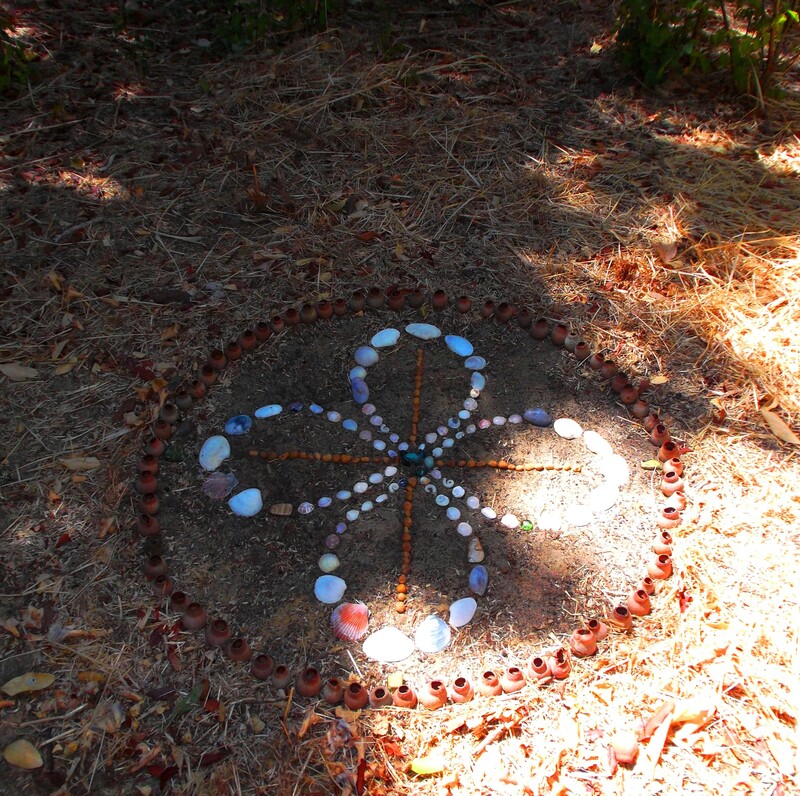 PS: I’ve posted a new page on the site, about connecting with ley lines, nodes and Gaia’s energy, which you’re welcome to read here. Following on from the previous post about the planetary alignment upcoming on May 28th, let’s look at the alignment positions. 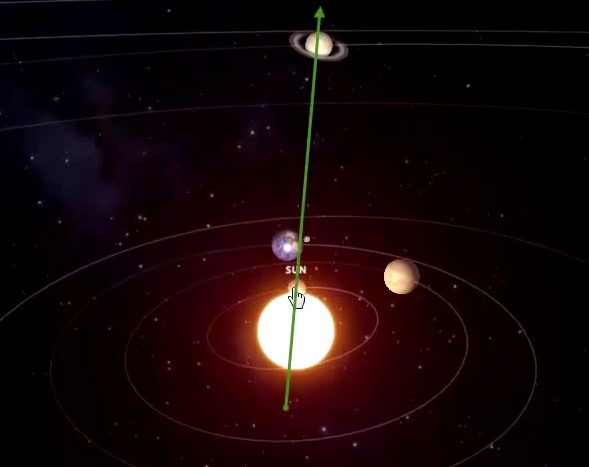 Firstly, Sun-Mercury-Saturn aligned on a trajectory that passes between the Earth and its Moon. Image from Ditrianum Media video simulation of planetary positions May 28 2015. Secondly, while that alignment is in place, Venus-Mercury-Neptune align at a right angle to Sun-Mercury-Saturn, forming a cross, an ‘X’, with Mercury, the catalyst, at its centre. Venus (in front of the Sun) aligned to Mercury and Neptune; image from Ditrianum Media. You can see in the above picture a direct Venus-Sun-Uranus alignment, but we’ll focus here on the Cross formed by the first and second alignments, and what its fusion of energies means in the process of Earth’s shift into higher frequencies. In the last post, we spoke of the Schumann Resonance, the background frequency of Earth, as 8hz, and how expansions of this frequency – higher ‘octaves’ of it, such as the 432hz, are recognized and used in music now for harmonizing one’s body/emotions/mind with the Earth’s natural Tone. 432hz is 54×8, and 54 (as a 9) is Angelic, a frequency of completion of cycles). To show you how converged energies flow across dimensions, I took the screen shot below of the site stats after publishing that post. Do you feel how everything is in its perfect place? Source’s expression through various frequency layers is all connected, always. Only the view focused into the play of separation doesn’t see or feel the innate unity and equilibrium of creation, and becomes mesmerized by the illusion of chaos, the void, the synthetic control of chaos. The Rose is the catalyst for Love, the Rose is the infinite spiral. That is why we say be the Rose, put a rose in every chakra, breathe rose into the spirals of your DNA, intimately echoing the Love Spiral of creation within you, which helps you open to the light of Source. (If visualization isn’t your thing, imagine breathing in the scent of a rose, or just hold the loving intention to bring rose energy into your being and anchor it there). Okay, returning to the alignments of Mercury and Venus, with a few words Ashtar gave: “The Wheel of Time is evident. The Mark is Set. The Phase is On.” Look again at the first picture, along the line of Sun-Mercury-Saturn. Here, Saturn’s Rings represent the ‘wheel of time’, Saturn being Chronos in the Greek mythology, meaning Time, and the ‘Lord of Karma’ in astrology – that which binds energies into the wheel of Time. Thoth, the soul aspect of Ashtar who was incarnate on Earth in Atlantis, Egypt and Central/South America, was called a master of balance, equilibrium, who knew the measurements of time. The Greeks called Thoth by the name of Hermes Trismegistus, the thrice-great Hermes, known by the Romans as Mercury, the winged messenger. Everything is perfectly placed, when viewed through sacred math and geometry. Alignments are streams of energy, windows for consciousness and actions of like energies. Sun-Mercury-Saturn I feel as a ‘higher dimensional bio-feedback’ where Mercury and Venus cataylze the rings of Saturn – the Wheel of Time – to open to a flow of higher Light (Source, through the Sun) which is angled between the Earth and the Moon, to dislodge what we could call a karmic binding energy from the Earth, the ‘death cycle/mortality energy’. If you read the last post about the reuniting of the Mother-Daughter energies (Demeter/Persephone) and the ‘agreement’ that was made for the stolen daughter energy to be reunited with the mother once each year in Spring, but returning to her role as queen of the underworld/realm of the dead under the dominion of Hades, I spoke of this time beginning a full reunification of the Feminine – that the daughter would no longer go ‘back to the dead’. This is the completion of a cycle, a release from the Wheel of Time, expressed through the alignments of energies we call planets (much more than 3D spheres), and assisted by our star family. This cycle will culminate in September with the Harvest Moon, completion of the tetrad of blood moons in the Hebrew calendar, which we’ll speak more of later. The current stage of this release is reunion of the Feminine energy on Earth, so she can come whole into reunion with her Divine Masculine as One. Ashtar – his projected energy in ‘green Thoth’ aspect – appeared here on May 13, number of the Divine Feminine, as a large green Orb angled to Venus. This is a sign of the coming Divine Masculine-Feminine reunion in the healing heart energy of green, renewal of life, regeneration and balance, at one with Gaia (for more about this see The Green Man, the White Stag, and the Rebirth of Gaia’s Divine Masculine). Ashtar’s green ‘Thoth’ orb upper right of Venus, May 13, 2015. While I was feeling into the energies of this Orb a few days ago, this beautiful photo was taken by Harry Perton in the Netherlands, near the city of Groningen. 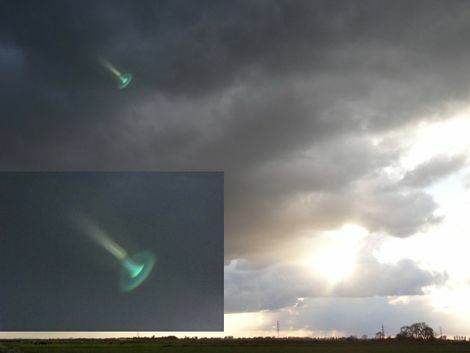 Photo taken by Harry Perton, near Groningen, May 20, 2015. 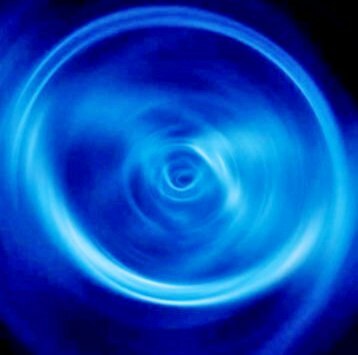 Can you feel the likeness of the energy, and how it’s also connected with the Shem Arua, Arcturian green-blue light rings and the spiral energy of the Rose? This green light near Groningen with a tail of golden light symbolizes to me the opening of the ‘wheel of time’, the rings of Saturn, during this alignment, allowing in a shaft of the golden Christ light…at this moment initiating resurrection of the daughter energy from the ‘underworld’. 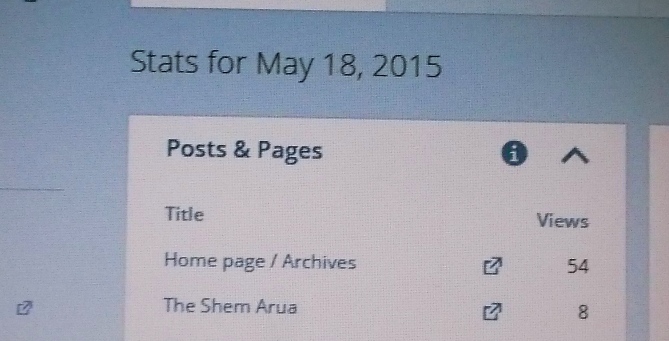 The Shem Arua, October 14, 2014. 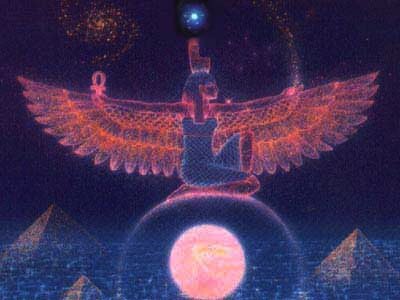 Isis and Ashtar were on Earth together as Twin Flames, remembered in Egyptian myths as Horus the Elder and his wife Isis (the Osiris-Isis twin soul connection came later). 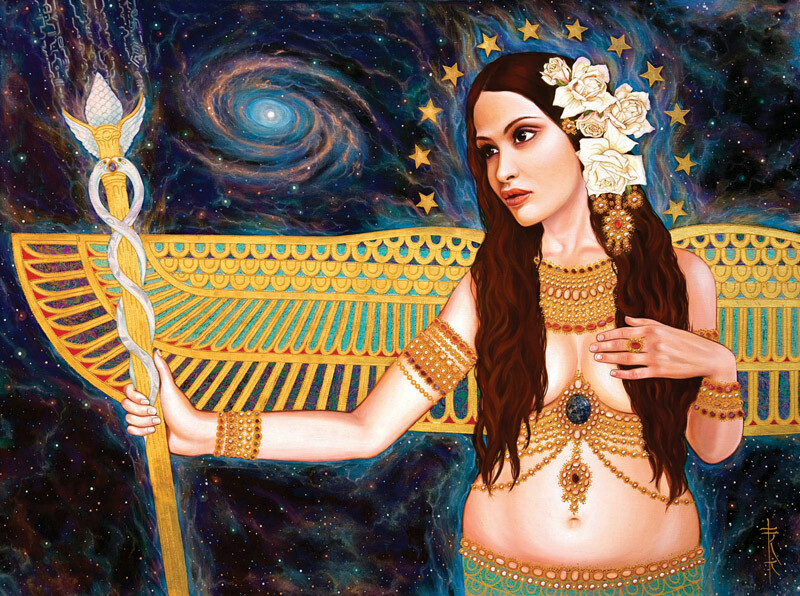 While feeling into Venus as the numeric frequency 54, and also 52 (in Mayan numbering), a post crossed my path, with a link to the work of the artist below, Lily Moses, and specifically, her painting portraying Isis as the Feminine Hermes, angelic, holding the caduceus wand, here tipped with a pine cone. Guardian of the Gateway by Lily Moses, Australia. There’s a lot of symbolism in this painting, but here we’ll focus on the pine cone (linked to the pineal chakra) which – if you look down on a pine cone’s tip – has two counter-rotating spirals, 8 running clockwise, 13 running counter-clockwise. The ratio 8:13 is the Phi ratio, the Golden Mean, and is reflected in other multiples in the Fibonacci sequence in nautilus shells, sunflowers, daisies, and is embedded in our DNA helix. 8 is the base resonance of the Earth’s frequency and 13 is the goddess/divine feminine frequency, which multiplies twice to 26, and four times to 52, the Venus vibration. ‘Four is Love’, I’ve heard from Sananda, and feel this within the ‘twinned twinned’ flow of the tetracross or four-petalled Rose Cross. Rose Cross double infinity sacred circle in my garden. So indeed, the Mark is Set, the Crossbar is lifting, the Phase is ON….or as I hear it, the Phase Ison > the Phase I-Son > the Faes’ Son > the Phase Isis-On. The 9, 54, brings the completion of this stage, full reactivation of the feminine energy in the spiral of Life, on Earth. This is a cycle within the flow of ascending energies that began with seeding (Comet Ison) and completes with harvest. If we flow with them too, we take the golden light IN with ease, as naturally as breathing, into the new rose dawn, a higher dimension of the spiral. With love and thanks to all holding, anchoring and steering the Light, to Isis and Ashtar, all family and friends on the ships and on the planet, to Gaia and all moving with her, including the elemental beings of fire, water, earth and air. Love and thanks also to my beloved Twin Flame, Ashura, for all you are and do. Asking now that the effects of these alignments on a planetary level be as smoothed as possible, and the Earth’s magnetic field be well supported. We can all help, by holding Gaia, and ourselves, in joy and love. Breathe golden light into your heart centre and expand it as a golden apple around your auric field. Open your chakras, base, sacral, solar plexus, sacred heart, heart, higher heart, throat, brow and crown. Visualize/intend a deep pink-red rose in your base chakra, and see/feel this rose open there, enveloping the whole chakra. 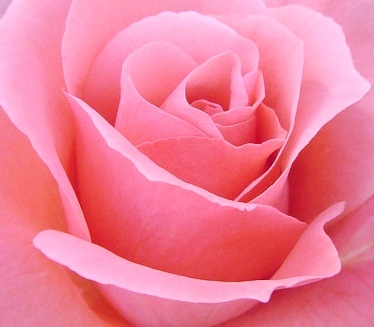 Now visualize a pink rose, slightly lighter, in the sacral chakra, open it there, let it envelop the chakra. Keep doing this, for each chakra, lightening the colour of the rose a little in each one. As you reach your heart centre chakra (remember the sacred heart chakra is between the heart and solar plexus, and higher heart between heart and throat chakras), the rose here is a mid light pink. As you reach your pineal chakra, the rose is white, with a pale pink centre, And your crown chakra is within a white rose. So you now have a whole spectrum from deep red-pink in your base to white at your crown. Relax, and let this whole spectrum of the vibration of Rose pervade your whole being. Now let this Rose energy ripple out softly around the whole Earth. Feel the deep, beautiful and sacred Love that you are, aligned with Source, serving Source, expressing Source as a pure eternal spark. I/we bow to your Essence. We are One. * Previous posts about Comet Ison can be found here and about Isis here.